Beef cattle require a diet rich in minerals for optimum health and growth. Unfortunately, the soil conditions in your region may not provide the proper nutrients if you rely on forage and feed alone. You can provide a free-choice mineral supplement to cows in the field, or you can add it directly to their feed to ensure they get proper nutrition for development and reproduction. Before you can select a mineral supplement and feeding method, you need to understand the mineral deficiencies present in your forage. 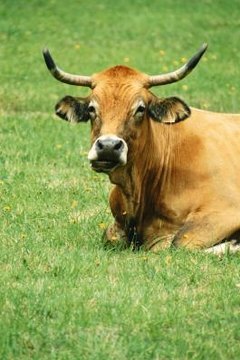 The mineral content of the soil varies substantially from region to region, which means that a supplement designed for cattle in Texas may be very different from one suited for cattle in Georgia. Common minerals in these supplements include phosphorus, copper, selenium, magnesium and zinc. When your cattle spend most of their time grazing on the range, free choice supplementation may be your best option. Mineral buckets or licks placed near grazing areas allow cows to supplement their forage as needed during the day. It can be difficult to ensure that all your cattle get the required amount of minerals using this method, however, so avoid free choice if your cattle have a critical deficiency in any particular nutrient. In addition, mineral buckets are vulnerable to the elements, so you should use weatherproof feeders to prevent an unexpected rainstorm from turning your mineral mix into an unappetizing, blocky mess. Some mineral supplements come premixed into feed, or you can mix a granular supplement in with your usual feed product. Doing this ahead of time can save some effort, but the small particles that make up most mineral supplements tend to fall to the bottom of the mix, resulting in uneven dosing. If you mix your own supplement, prepare small batches to keep as much of the supplement suspended in the feed as possible when you deliver it to the cattle. The best method for ensuring a controlled dose of supplement is top dressing, or adding the supplement to the feed immediately before the cattle consume it. After preparing the feed in troughs, sprinkle the supplement over the top as if you are salting food. This ensures that cattle take in a sufficient amount of the supplement as they eat. Top dressing is best suited for situations where minerals are critical to development, such as during the spring, when natural magnesium deficiencies in forage can lead to dangerous health conditions like grass tetany.